Miklós Jancsó‘s extraordinary mise en scene dominates this film that was meant to celebrate 50 years of the Bolshevik revolution that formed the Soviet Union. The ‘reds’ are the communist whilst the ‘whites’ are reactionary forces opposing the working classes. You’d expect, of course, that the reds would be celebrated over the whites however Jancso, instead, shows there are only losers in war. His steady tracking shots are usually more interested in the landscape than the action which seems, almost accidentally, to happening in front of the camera. Characters, and conflict, appear, and reappear, whilst the camera flows on its stately way. This estranges us from the action, giving the film a Brechtian dimension that encourages to think about what we’re seeing. Similarly, we are often unsure who is which side and our Hollywood-conditioned seeking for the ‘good guys’ is undercut by the cruelty, and humanity, of both sides of the conflict. Similarly, we are not invited to identify with the characters so there is no bourgeois individualism. 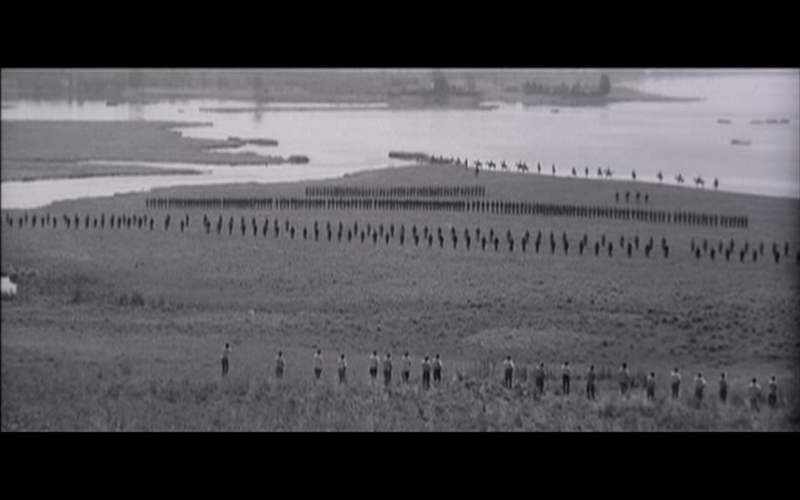 Jancso’s compositions are often extraordinary; such as the one above at the film’s climax. Quite simply a brilliant film.